It’s the most wonderful time of the year! 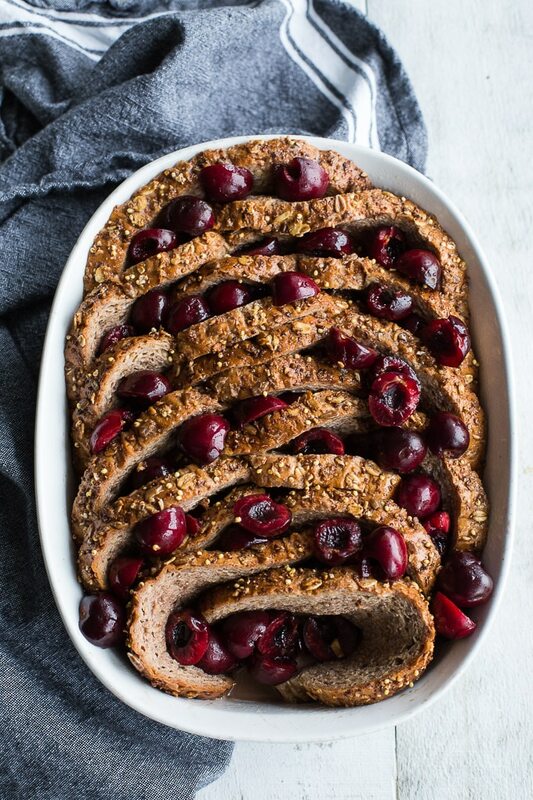 It’s cherry season and this Dark Chocolate Cherry French Toast Bake is the perfect way to celebrate the season! We’re talking thin slices of bread, dipped in a cocoa-y egg mixture, baked with fresh cherries, and topped with melted dark chocolate! Umm, maybe this should be dessert, not breakfast?! Happy summer friends! How did you spend your first official weekend of summer? While June in Newfoundland has been less than summery, we had a bit of a turnaround this past weekend. We had some warm temps and sunshine (at least for one day) and, while it was windy, it was lovely enough for coffee on our back deck and a hike on some nearby trails. I am now officially pumped for summer! Of course, the weather isn’t the only reason I’m pumped. All the seasonal fruit has me pretty excited too! This past weekend, I picked up my first container of peaches, and blueberries are finally a decent size. And most importantly, I picked up some more cherries. This is my third container already, and I’m pretty sure I will need to re-stock by the end of the week! I mean, is there anything better than these juicy red gems!? While these beauties are great for snacking or adding to smoothie bowls, they really shine when paired with dark chocolate. 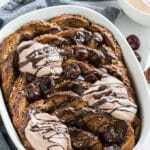 And since breakfast is my favourite meal of the day, this Dark Chocolate Cherry French Toast Bake wasn’t a stretch to come up with. It’s chocolatey, easy to make, and feeds a crowd! Pretty much summer brunch perfection! 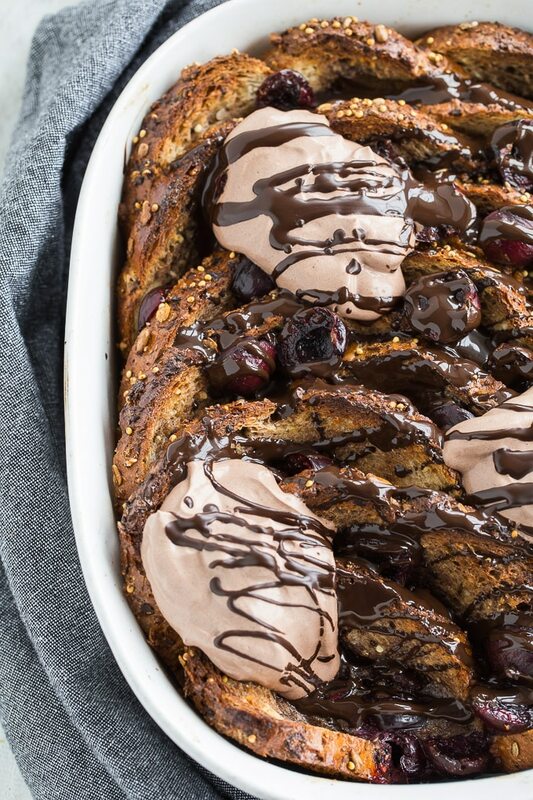 What type of bread should you use for this Dark Chocolate Cherry French Toast Bake? While any kind of bread will work in this bake, I like to you President’s Choice Protein Bread. This isn’t a sponsored post, it’s just one of my favourite breads to use in recipes. It’s thinly sliced and made with grains, seeds and chickpeas. The shape also works perfectly for layering in this dish. If you can’t find this protein bread or something similarly, you can use sourdough, Italian or French bread, whatever you prefer. You just want to make sure the shape of the bread conforms to the shape of the baking dish you’re using. I used a 8″ x 10″ oval baking dish, so an oval loaf worked well. 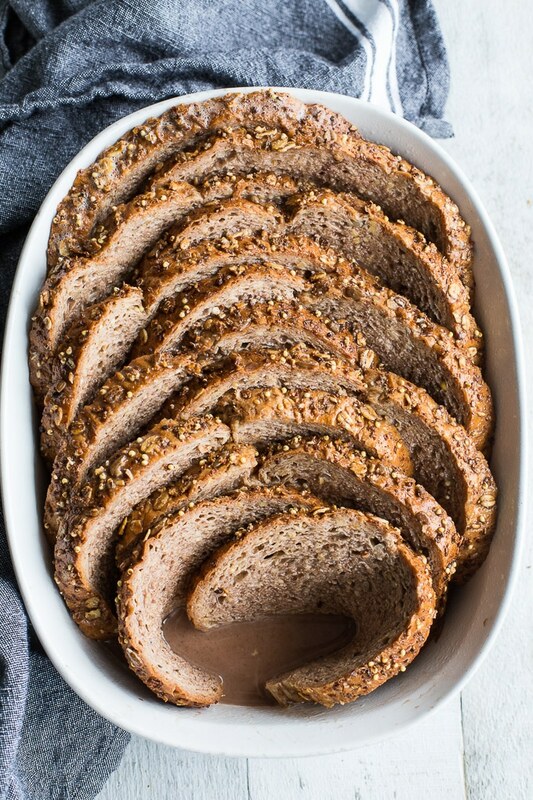 As each slice of bread is placed upright in the dish, you also want to make sure the bread is thinly sliced so it shapes around the dish easily. See photo above. The egg mixture for this bake is really simple. Eggs, almond milk, cocoa and cinnamon. You can whisk all the ingredients together, but I like to use my handheld blender to ensure the cocoa and cinnamon are well blended with the eggs. It might seem like you have too much egg mixture, but don’t worry, you don’t. Dip each piece of bread in the mixture before placing into the baking dish. Then pour the remaining mixture over the bread assembled in the dish. The bottom of the bread will be swimming in egg, but this will bake around the bread and help keep the french toast bake together. While you need to bake this dish for 40-45 minutes, be careful not to over-bake as you don’t want the top of the bread (not in the egg mixture) to burn. I didn’t make this recipe overly sweet as it’s topped with melted dark chocolate, and if you’re anything like me, you will also add maple syrup. But if you prefer your french toast sweeter, you can always add a little bit of coconut sugar to the egg mixture. That’s it! Scoop onto plates and serve with your desired toppings! I love adding chocolate coconut cream and a little drizzle of maple syrup! And a sprinkle of sea salt is delish too! How do you enjoy your french toast? Let me know in the comments below. And if you make this one, be sure to share a photo on Instagram and tag @crumbtopbaking so I’ll be sure to see it. 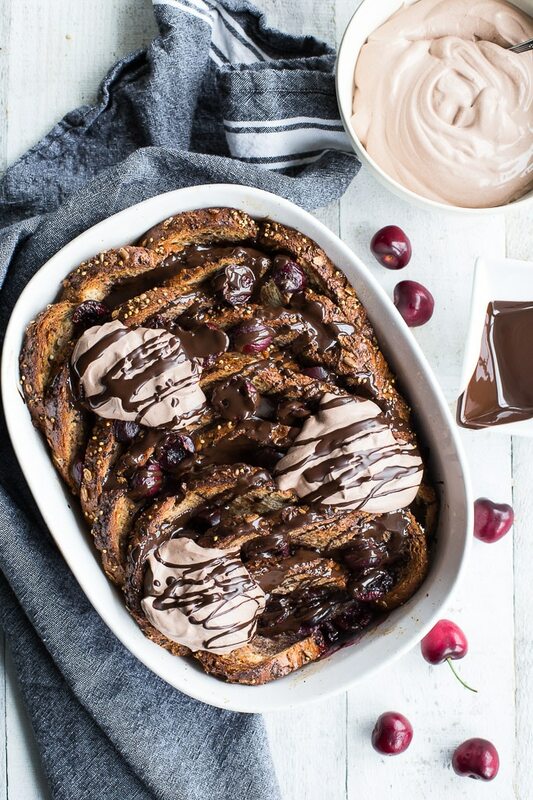 Dark Chocolate Cherry French Toast Bake is the perfect brunch bake for cherry season! It’s loaded with fresh cherries and melted dark chocolate, and it’s super easy to make. Whip this one up to serve for breakfast, brunch or even dessert! Pre-heat oven to 350 degrees and grease an oval baking dish (I used a 8″ x 10″ dish). In a medium-sized bowl, use a whisk or handheld blender to mix together eggs, almond milk, cocoa and cinnamon. Dip each piece of bread into the egg mixture, coating on each side, and place in the prepared baking dish. Ensure each piece is layered into the dish upright and horizontal. Depending on the shape of your dish, you may wish to curve the pieces of bread on the ends and overlap them in the middle. Pour the remaining egg mixture over the bread that’s arranged in the dish. 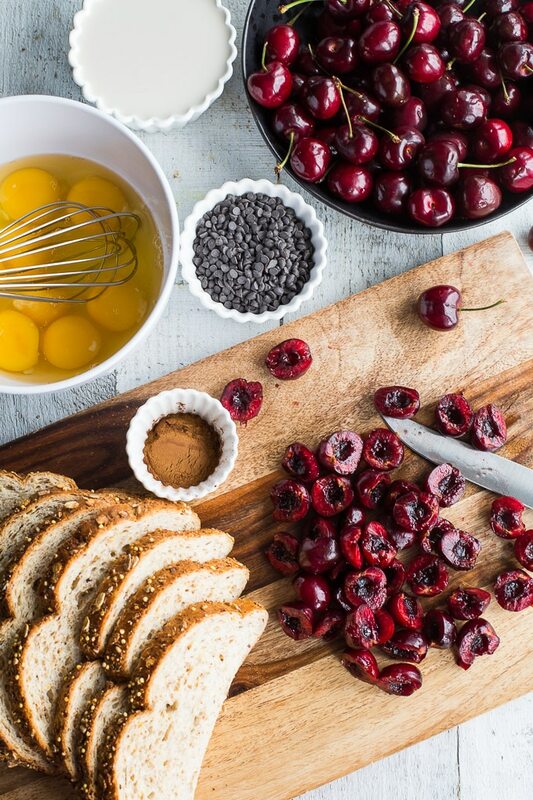 Sprinkle the cherries on top of the bread, tucking some in between slices to ensure they are baked in throughout the french toast. Bake for 40-45 minutes, or until the french toast bake is firm and the top is browned. Remove from oven. Add the chocolate and coconut oil to a microwave safe bowl and microwave for two 30 second intervals, or until chocolate chips are melted. Be sure to stir in between intervals. Drizzle half of the chocolate over the french toast bake, reserving the remainder to drizzle on individual servings. Scoop onto plates and serve with desired toppings. Store any leftovers in the fridge and enjoy within 2-3 days. I used President’s Choice Protein Bread in this recipe but you could also use sourdough, Italian or French bread, whatever you prefer. You just want to make sure the shape of the bread conforms to the shape of the baking dish you’re using. I used an oval dish, so an oval loaf of bread worked well. Thin slices of bread also work better for shaping around the baking dish. And make sure the bread is stale. If it’s too fresh, the french toast may turn out mushy. What a beautiful recipe, Leanne! Love that you didn’t make it overly sweet and especially love the suggestion of maybe sprinkling with a little sea salt – that sweet/salty combo always gets me! So excited for all the summer produce and you’ve certainly done those cherries justice with this one 😉 P.S. I don’t think I’d have any problem polishing this one off in a day…it wouldn’t last the 2-3 days, lol. Thanks Dawn! I’ve made this French toast a few times now, and it’s difficult only eating one piece! It’s great for sharing, that’s for sure! Hope summer is treating you well! Thanks Ashika! It’s my go-to brunch dish lately when I’m craving something decadent! I love the way you think Katherine! Some chocolate cherry nice cream would be perfect on top of this French toast! I do love cherry season and they look right at home in this cocoa dream toast! The weather is really weird this summer but I’ll keep it…I’m just glad school is out and the produce is phenomenal! This is such a delicious way to use those sweet, juicy cherries. Cherries and chocolate are a match made in heaven! Cherries and chocolate are probably one of the best pairings ever! I hope you are having an awesome summer Marcie! I’m drooling. This looks soooo heavenly, Leanne! I can’t get enough cherries right now and this is the perfect excuse to buy more :). Hope you’re having a great week! Thanks Heather! It’s a great sweet treat for a weekend brunch! Hope you’re having a fantastic summer! I’m so excited about seasonal fruit and berries too. Cherries are still a bit expensive to use in cooking, but I’ve already eaten my first few pounds. And this recipe is fantastic! 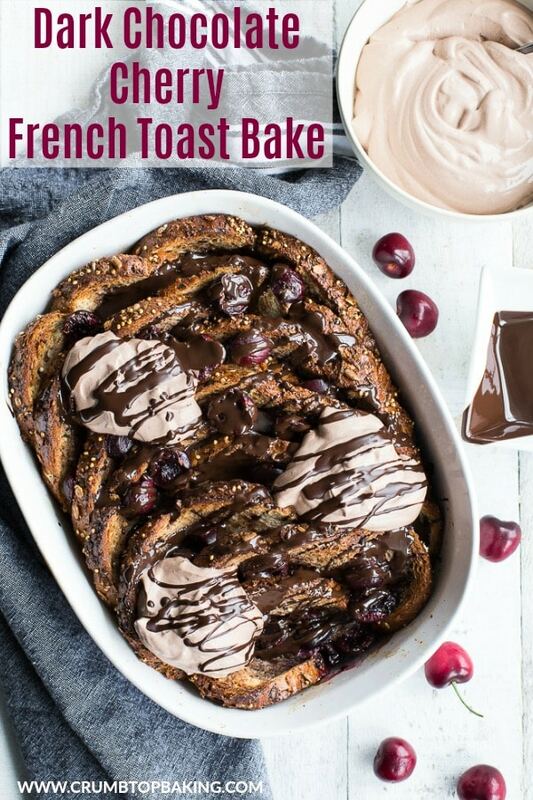 Chocolate and cherries combined with french toasts? I’m certainly in! Thanks so much Ben! I agree. I’m going to be broke feeding my cherry addiction this summer. Luckily, they are more reasonably priced at Costco! This recipe looks incredible Leanne! I love French toast as it is but you take it to the next level! I also loved seeing the process photos! So beautiful. Thanks Christie! I’m trying to include more process photos so I’m glad you liked them! Wish I could share this French toast with you! You had me at dark chocolate!! I’m a huge fan of breakfast recipes. This recipe looks amazing! Thanks Terry! Breakfast is my favourite meal of the day! Glad you like this one! What an absolutely decadent breakfast Leanne! So perfect for those summer cherries! Thanks Mary Ann! Cherries and chocolate make the best decadent breakfast! Gosh darn, this looks so amazing! Thank you for the inspiration bc now I know what I’m doing with the cherries from my cherry tree! Also, amazing pictures once again! Wow! This is just amazing! I love that it’s not overly sweet. I will definitely be trying this! Thank you Lisa! I would totally recommend giving this one a try! It’s not too sweet at all!. Yummy french toast bake! Chocolates and cherry are my favorite combo. Delicious taste indeed! Thanks so much! It’s a great combo for sure. Whaaaaaaaaaaaaaaaat! This sounds amazing. I can’t wait to give this a try! Oh my gosh, seriously drooling over here…..
Oh my goodness I love chocolate and cherries. This sounds so decadent and fabulous! I must get some GF bread and try this asap! I hope you get to try it! Thanks Lizzy! Let me know what you think if you make it! Thanks Terri! I have really been enjoying the chocolate and cherry combo this year! Oh wow this sounds amazingly delicious! 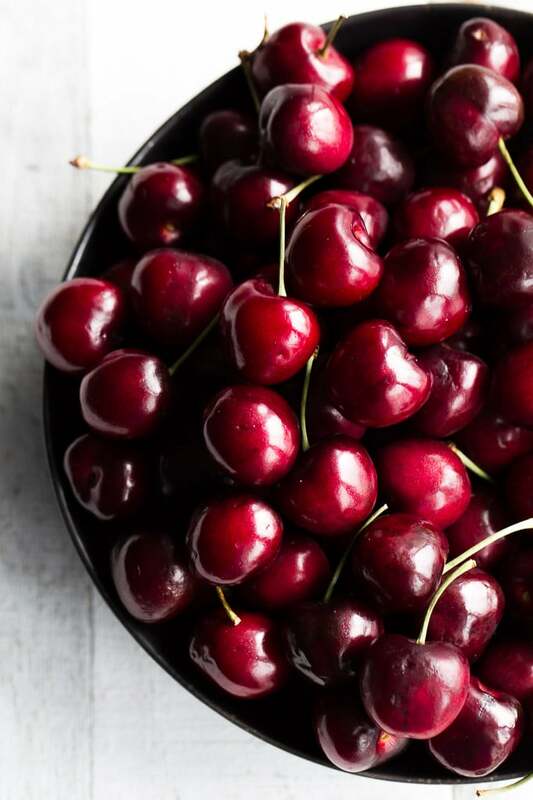 I love the combination of the fresh cherries with the dark chocolate – I can’t think of a better pairing either, YUM! Thanks Jessica! I’m seriously obsessing over the chocolate cherry combo this summer! Glad you like it!